As with other arms of the wargaming hobby, rules can vary greatly in complexity. Commercially available historical rulesets cover practically every era of naval warfare from the ancient and medieval ships through the fleets of the Age of Sail, the ironclad and battleship eras to the modern era. Models of most common types of ships are available, but in many cases wargamers have to source their own models, either by conversion or scratch building, especially where more esoteric periods or scales are in use. The Age of Sail rules for the 1972 Don't Give Up The Ship call for pencil and paper, six-sided dice, rulers and protractors, and model ships, ideally of 1:1200 scale. Single ship engagements can be played on a tabletop, but fleet battles require more space. The rules are elaborate and cover morale, sinking, fires, broken masts, and boarding. Wind speed and direction are determined by a roll of the dice; a protractor is used to measure the angle between the wind and ship directions and hence determine ship speed. The protractor is also used to determine which cannon can fire on an enemy ship, as well as the damage caused and the chance of hitting at short range (4") and long range (16"). The conclusion of the rulebook provides the statistics necessary to re-enact historical encounters such as during the War of 1812. The second edition added 4 pages of simplified rules for battles between fleets. One of the most popular sets of rules available at present is General Quarters, written by Lonnie Gill. Quick and easy to play, they have established themselves over the years as one of the leading sets of World War I and II era rules. General Quarters 1 and 2 feature a slightly abstract combat system and ship definition system reminiscent of naval board wargames. However, this approach led to a fast-playing system that was the root of its popularity (probably coupled to an extensive array of supporting information and ship statistics). 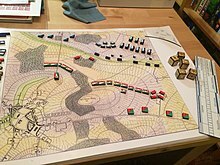 GQ1 and 2 have recently been replaced by a less abstract version, GQ3 which covers World War II; a World War I version entitled Fleet Action Imminent was released in January 2008. The 1975 naval wargame Don't Give Up The Ship. ^ Nick Davis. "All At Sea Part One". Ruleset. White Dwarf. Archived from the original on 2007-10-09. Retrieved 2007-06-14. ^ "The Ports of Pelargir". Website. Archived from the original on 2007-03-13. Retrieved 2007-06-14. This page was last edited on 12 January 2019, at 12:15 (UTC).